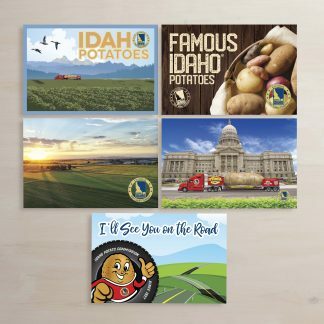 Even though the Famous Idaho Potato Tour has been on the road for over three months, each stop never fails to provide the Tater Team with a new and exciting adventure at every turn of the Tater Truck. From the long stretches of highway and hot parking lots to fireworks and parades, our special guest for the week, Gracie Bingham, was treated to the full experience of being part of the Tater Team. Our relaxing day at the beach hardly prepared us for a jam-packed schedule, but we took it in stride and had an unforgettable week. We were up bright and early Monday morning to bid farewell to Florida and make our way up to Atlanta, but the truck hitch refused to cooperate with our tight schedule. We spent several hours at a repair shop waiting for a new part, during which the tired Tater Team attempted to catch a few more minutes of shut-eye. Finally, the talented mechanics were able to fashion a new part for the stubborn hitch and we were on our way to Atlanta! The grueling eight-hour drive to Atlanta was made much more enjoyable by all the folks waving, smiling, and taking photos of the truck along the interstate. This was Gracie’s first experience riding in the truck and feeling a bit like a celebrity, but hopefully she won’t let it go to her head. 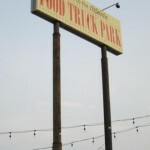 Our first destination in Atlanta was a food truck park, so after more than 10 hours of being in the truck, the team was thrilled to set foot on solid ground and enjoy some Georgia barbecue. 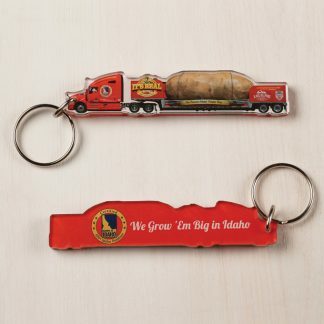 We parked the spud at the food truck park for the night and made our way to Walmart to stock up on fresh potatoes and Idahoan products for a basket we would be presenting to Meals On Wheels at the food truck park the next day. There’s nothing quite like battling the crowds of Walmart armed with sacks of potatoes and dressed in our matching uniform of yellow shirts and red hats, but we emerged victorious, ready to take on the next challenge that came our way. Potato warriors, if you will. Exhausted but content, we settled down in our hotel (located right next to World of Coke and Centennial Olympic Park!) to rest up for another busy day. We also bid farewell to Kaiti, who would be taking a temporary leave of absence from the team for a few days to watch fireworks with her love in Portland. The next day dawned with another challenge to overcome—we needed to find a suitable basket for our Meals On Wheels presentation that morning. That surprisingly difficult task led us to a morning romp through Target, where we again emerged triumphant, clutching our prize in hand as we hurried back to the food truck park to greet its denizens and prepare our basket of potatoes for the presentation. 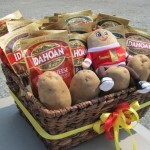 Ellis did a masterful job of arranging the Idahoan packets and fresh potatoes while Gracie diligently crafted an attractive bow—it was a feast for the eyes as well as the palate. 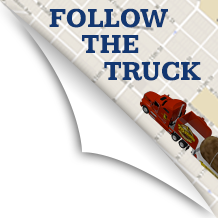 As we toiled away at our basket, food trucks started rolling in. Tacos, Jamaican jerk, Southern homestyle, and Cajun were among the delicious choices available to Atlantans. Joining us at the food truck park were representatives from local Meals On Wheels chapters and Clay Campbell of Idahoan. Ellis helped Clay Campbell present our honorary basket to the Meals On Wheels representatives on behalf of Idahoan, who generously donated 350,000 servings of dehydrated mashed potatoes to Meals On Wheels! 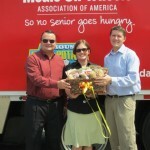 Many thanks to them for helping to stamp out senior hunger. After the presentation, we sampled the enticing food truck fare. Ellis downed a massive lemonade to beat the heat and Gracie chose a delicious Jamaican fish sandwich. 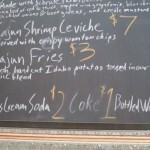 We also couldn’t resist trying some Cajun fries made with our very own Idaho potatoes! After we were thoroughly stuffed, we bid farewell to the food truck park and hauled our tater to Publix for the rest of the afternoon. We enjoyed meeting the fine folks of Atlanta and sipping some sweet tea that Publix kindly donated to our effort to stay cool. Ellis and Gracie were also lured into the cool, airy Publix to purchase some Georgia peaches, which lived up to their excellent reputation. We returned back to our hotel, happy and satisfied with an eventful day and ready for what the Fourth of July would bring us. 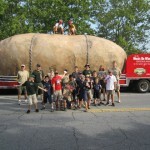 Everyone loves a parade, but especially a Fourth of July parade with a giant potato. We were fortunate to be included in the annual Dunwoody parade. The parade organizers even supplied us with enthusiastic Boy Scouts who helped us hand out coupons for free Idahoan products! 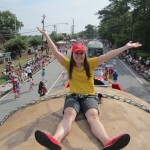 Dunwoody, a city right outside of Atlanta, sure knows how to throw a parade—it’s one of the oldest and most well attended parades in Georgia. The entire two-mile route was filled with people decked out in red, white, and blue. Patriotic Braves hats also adorned many a head. And just like their football, Southerners don’t do parades on a small scale. Barbecues, complete with tailgating tents and lemonade stands, dotted the route. 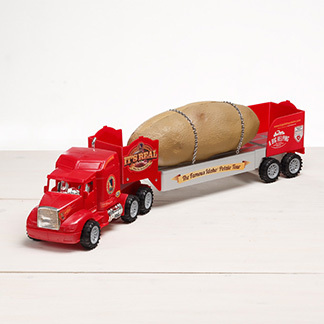 If the Tater Team feels like celebrities on the interstate, it was no competition to what we felt riding atop the potato, waving to adoring fans along the parade route. We were greeted with cheers and shouts of “That’s not a potato—that’s a mountain!” and “Now THAT’S a potato!” Quite a few kids were dumbfounded as to how we got up onto the potato and some concerned citizens wanted to make sure we were strapped in for the ride (we used Ellis’ rockclimbing gear to harness in). 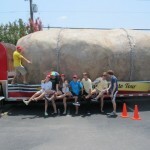 It turns out the harness came in handy, as some low-hanging branches nearly swiped the Tater Team off of the potato. But we hung on, much to the great delight of the crowd. Despite battle scars from the branches and sore cheeks and wrists from smiling and waving so much, we felt on top of the world by the end of the parade. 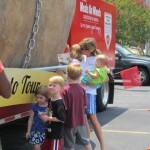 We think the potato even got a little bigger from all of the attention it received. Just to top off a wonderful parade, we were awarded 1st place in the business/government category! Dunwoody sure welcomed us with open arms. And there’s no better way to celebrate a glorious ride atop a giant Idaho potato than enjoying a hamburger and Idaho fries at Five Guys! After refueling and resting up after the excitement of the morning, Ellis and Gracie joined thousands of Atlantans in watching fireworks at Lenox Square. As “Georgia On My Mind” accompanied the blasts of fireworks, we reflected on the events of the day and looked forward to getting a good night’s sleep before heading back on the road in the morning. Our morning journey took us to Alabama, where we were greeted by the kind people at the Western Supermarket in Vestavia Hills. We broke out the prize wheel and Ellis broke out a Southern staple, Blue Bell ice cream, to stay cool. We were visited by a reporter from the Birmingham Times as well as a cameraman from one of the local news stations. 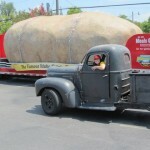 The next day, a scheduling snafu yanked Gracie suddenly from the poolside to man the potato at a Bruno’s in Birmingham. Despite the intense heat, she thoroughly enjoyed chatting with the many friendly folks that stopped by on her last day of being part of the Tater Team. Some kind souls took pity on her and brought her water, ice, and even sweet tea to help her stay cool. She was most impressed that Southern hospitality extended as far as the hottest of parking lots. Sweet home Alabama, indeed! The Tater Team fittingly celebrated Gracie’s last night on the road with a meal at Los Compadres, where Ellis once again got the chance to practice his Spanish. No matter that they spoke English back to him. With full bellies and tired eyes, the Team headed back to relax and enjoy their last night in Birmingham. The Team and Gracie sadly parted ways when Gracie left for the airport and the Team headed up to Nashville to pick Kaiti up. It was an unforgettable week, but that comes with the territory of hauling a truly unforgettable tuber around the country. We can’t wait to see what lies around the corner.